Previously we delivered three guides – IPTables Basic Chapter 1, IPTables Basic Chapter 2, IPTables Basic Chapter 3 for the new server users. 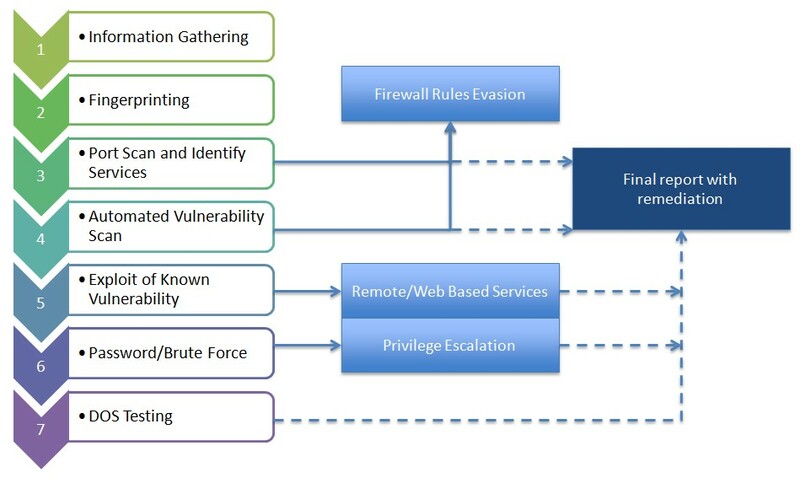 If you fall among that group, please check the articles for any missing step to arrange a basic security. After Securing Server, Basic Penetration Testing For Security is Needed. Here Are Few White Hat Tools & Commands For Testing Brute Force Vulnerability. These are not intended to run on others server. In very short, the shown methods are incapable to even initiate a genuine planned hacking attempt. But they are not for running these on other’s domain, server etc as your IP can get blacklisted and you are really a trained hacker. What We Will Do With Tools & Commands For Testing Brute Force Vulnerability? Brute force attack can be used to attempt to decrypt any encrypted data. For password guessing, this method is very fast for the short passwords and for longer passwords methods like dictionary attack are used. Brute force attacks are like problem solving technique. As theoretical time limit, we can increase the probability of time to be taken to break. We will show how an attacker gathers the information and plan to run scripts as script kiddie to disturb you. If you can hide some (or most) of the information or broadcast misleading information, basically it becomes difficult to run the automated tools. We really can not make all points 100% fool proof. As we will know our weak points, we can do vigorous monitoring and logging around the weak points. It is obvious that, unlike our other guides we can not show each and every point to make secure. Kali Linux, WHAX, Backbox, Pentoo etc are penetration test focused GNU/Linux distributions. Normally you’ll not need them for our guide. But you run Kali Linux as desktop OS to test, inform your web host about performing testing on your instance. Kali Linux is good as server OS as the kernel is designed to be injection proof and developers are restricted to directly commit on the project. Importance : Gives data about unmanaged third party services. Unmanaged DNS is easy to spoof. Importance : We have 3 ports open to enter. Importance : Ports are filtered but how is filtered is unknown. Importance : The host uses venet0 interface to accept all including localhost. What version of softwares they use? Host is up (0.000013s latency). 5178 numbered password matched with our dump of 10000 passwords with ncrack most fast. We can make that thing more faster, that is different topic. Usually if logically these are tested with own interest and vulnerabilities closed, it is actually difficult for an novice script kiddie to intrude. On virtual server, it is more common to get knocked out by SSH brute force flood or have XML-RPC attack. If there is no proper IPTables rules, Fail2Ban like basic security software configured, root user not changed, anyone virtually can get clear password and straightforwardly SSH into. It is not that dedicated servers (with sane hardware, from proper web host and sane number of traffic) costs huge, but managing dedicated really demands intelligence. As the titles tells the intention – Tools & Commands For Testing Brute Force Vulnerability (White Hat) , we are limited by ethics to show anything more. It does take time to crack Facebook account. This Article Has Been Shared 238 Times! Commonly, Transactional Email Services Like Mandrill is used With Google Apps. Here is How to Add DMARC, DKIM, SFP to Avoid Email Spoofing. Here is How to Fix Nginx OCSP ERROR – OCSP Response Expired After Enabling OCSP Stapling on Nginx. Error is Due to Certain Criterion of RFC. Here is a Handy Guide For the New Users Around Ubuntu 14.04 Nginx HTTP/2 Directive, NPN & ALPN. Sadly, HTTP/2 is Not Exactly Easy Like SPDY. We have explained the implication of the error message “This site works only in browsers with SNI support”. It is a thing related to IPv4. Cite this article as: Abhishek Ghosh, "Tools & Commands For Testing Brute Force Vulnerability (White Hat)," in The Customize Windows, December 4, 2016, April 23, 2019, https://thecustomizewindows.com/2016/12/tools-commands-for-testing-brute-force-vulnerability-white-hat/.